St. Albans – Alvin O. Ward, a resident of this community since 1948, passed away peacefully, Thursday, July 20th, 2017, at The Villa. Born in Cumberland, Rhode Island on April 4th, 1923, he was the son of the late Hugh S. and Maude (Pollitt) Ward. Al was 94 years old. On June 22nd, 1946, he married Barbara Capwell, who survives him. They just celebrated their 71st anniversary. 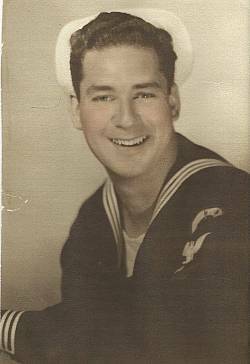 Al was educated in Rhode Island and then enlisted on October 31st, 1942, in the United States Navy. He received his Honorable Discharge on February 5th, 1946. He moved to Vermont to begin a 28-year career with General Electric, retiring in 1988. He was a longtime member of St. Luke’s Episcopal Church, where he served as a Vestryman for 2 terms, Past President of the St. Albans Historical Society and Museum, a member of Green Mountain Post # 1, American Legion, Robert E. Glidden Post # 758, Veterans of Foreign Wars, Franklin Lodge #4, Free & Accepted Masons, Champlain Chapter # 1, York Rite, and served on the Board of Directors of King’s Daughters and St. Albans Cemetery Association. 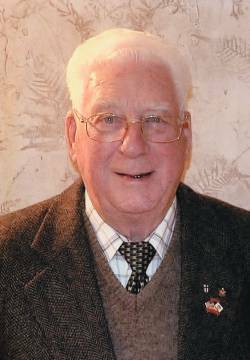 He also was a member of the Naval Mine Warfare Association and was very active and Past President of the Vermont Auto Enthusiasts, where he was known by his car buddies as, “Alfie”. Al is survived by his wife, Barbara, of St. Albans; their daughters, Linda Castle and her husband, Robert, of Rochester, New York and Lori Derry and her husband, Bryan, of Sheldon as well as his grandchildren, Sandra Rhoads and her husband, Jerry, Daniel Castle and his wife, Jennifer, and Matthew Derry and his wife, Sonia Betts and his great-grandchildren, Keegan and Mackenna Rhoads and Violet and Gavin Derry. In addition to his parents, Al was predeceased by his brothers, Malcolm, Hugh and Samuel Ward. A funeral service will be held on Monday, July 31st, 2017, at 6:00 P.M. at Grace Episcopal Church, 215 Pleasant Street, Sheldon with the Reverend Janet Brown officiating. Prayers of committal and military honors will be held on Tuesday, August 1st, at 11:00 A.M. at the Georgia Plain Cemetery. Those planning an expression of sympathy are asked to consider the Grace Episcopal Church, 215 Pleasant Street, Sheldon, Vermont 05483. Assisting the Ward family is the Heald Funeral Home, where Al’s on-line guest book is available at www.healdfuneralhome.com.